Our state makes it legal to possess, grow, use, and gift marijuana among adults 21 and older on July 1, 2015. But our legalization measure says that the state won’t begin the licensing process until January 4, 2016. That will allow commercial growers to begin planting and it will take a full grow cycle before they will have produced usable marijuana for sale. Then the stores will have to become licensed, then inspected, and by the time everything is done according to Measure 91, it will be August or September of 2016 before we see our first legal marijuana sale. So, where are adults getting the marijuana they possess, grow, use, and gift legally for the intervening fourteen to fifteen months? One thing we hear constantly from our legislators is the need to follow the directives of the Department of Justice’s Cole Memo, which says, in part, that states that legalize marijuana must make sincere efforts to discourage interstate leakage of marijuana and cover for black market sales of marijuana intrastate. That’s why they passed onerous new regulations on the medical marijuana side, right? We had to reduce plant counts and require lots of tracking so we discourage the black market, right? If we do not get onboard with Sen. Ferrioli’s idea, are we not then encouraging interstate trafficking and incentivizing the black market? For the months following July 1, if there are no pot shops in Portland, you can guarantee an increase in the people crossing the Columbia River to buy Washington weed, people who have already made two pot shops in Vancouver the #1 and #3 top sellers in Washington. Vancouver, with just four legal pot shops, out-sells all of Seattle, with its fifteen legal pot shops. Then there are the currently existing medical marijuana dispensaries. If we do not allow them to sell to recreational customers, it is going to happen anyway, but through a steady stream of entrepreneurial OMMP cardholders who will collect donations from friends, buy in bulk, and “gift” those friends their share of medical marijuana. Unless one of those friends is an OLCC undercover, nobody is ever going to catch this group in the act, and the marijuana, once removed from its dispensary packaging, will be indistinguishable from the legal marijuana all adults are allowed to grow and possess. And, of course, someone legal to grow four plants, if they do it correctly, can produce a lot of usable marijuana. We’ll be legal to possess eight ounces at home. 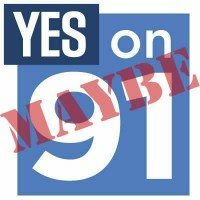 Measure 91 also makes up to twice those amounts only a ticketable offense. So, we’ll have a whole bunch of adults who can grow seven plants and possess a gram shy of a pound of weed, and they’ll be perfectly legal to “gift” up to an ounce of that marijuana to other adults. But if anyone exchanges money for that weed, that’s the black market we’re talking about, right? Now, naysayers will argue that the medical system lacks the sort of “seed-to-sale” tracking they believe is required for the Cole Memo. Or that the medical system isn’t set up for taxation. Or the medical system won’t be able to handle the demand. Or the prices will skyrocket. Somehow, the sky will fall. But the medical system has no “seed-to-sale” tracking now and Oregon’s seen very little interference from the feds in sixteen years. It’s hard for me to believe that a government that is so eager to tax marijuana at the state and (despite Measure 91) local level can’t figure out how to do so with a month to go in the legislative session. The medical system, if you believe the legislature, is already supplying all the Oregon demand and a whole lot of out-of-state demand. Oregon consistently has the lowest price on quality marijuana in the nation, and that’s largely because we have such abundant supply. The whole point of passing Measure 91 was to take what was criminal and make it legal. If on July 1 we legalize adults’ right to possess, grow, use, and share marijuana, but provide them nowhere to get it legally, we are incentivizing criminal activity and gaming of the medical system. Open the dispensary doors to all adults on July 1. After all, how can selling marijuana to healthy people be any more risk than selling marijuana to sick and disabled people?